Working for the famous adventure magazine isn't all just exotic locales and spectacular photo ops; there's a fair amount of danger that goes hand-in-hand with the glamour. Here are just a few of the things that can go wrong on expedition. The Photo Society, a group of shutterbugs that regularly contribute to National Geographic Magazine, polled 45 of its members about their experiences in the field and tabulated the results. Their mishaps range from paraglider crash landings and arrests to flesh-eating bacterial infections and getting stoned (with rocks not weed). And, somewhere in Florida, a panther patiently waits—third time's the charm, right? 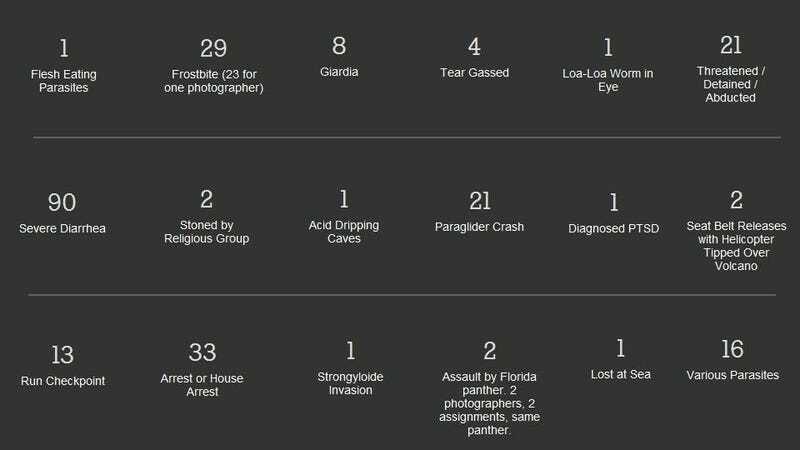 Check out the full list of pitfalls and hazards these intrepid photogs face every time they're on assignment at The Photo Society.